Leica Monochrom-M Updated. Leica today announced a new version of the M-Monochrom (Typ 246) camera, basically bringing the black and white M up to the same standards as the current M (Typ 240). Article on sansmirror.com. Camera data page. Nikon Canada Closing Service Centers. NPS members in Canada received an email today that indicates that all service centers in Canada except for the one in Mississauga, Ontario, are going to be closed. Service in Richmond, BC, and Montreal, Quebec, will be discontinued. Article on dslrbodies.com. CIPA Numbers for First Quarter 2015. 231k mirrorless, 676k DSLR shipped for March. For both types of cameras, the Q1 numbers for 2015 are down from 2014. Mirrorless ran at 86% of 2014, while DSLRs ran at 93% of 2014. Article on dslrbodies.com. Samsung’s DxOMark. DxOMark published their ratings for the Samsung NX1 camera. Already the Internets are alive with repeats of the “new king of APS mirrorless” headline. Article on sansmirror.com. What Should a Nikon V4 Be Like? With the J5 now out and about, it’s really easy to say what a Nikon V4 should be like. Article on sansmirror.com. Best Description of Camera Designs Yet. Article on dslrbodies.com. First Sales Results Posted: Not so Great. Canon was first to fully report their first quarter of 2015 sales results (the other Japanese companies all have fiscal years that ended March 31st, and they tend to do their annual report on results in May). Article on dslrbodies.com. Adobe’s Not So Smooth Rollout. This morning I awoke to an InBox filled with Lightroom 6 issues. I also noticed that I had 17 pending updates from Adobe. Article on dslrbodies.com. Note, this article also contains information on ACR 9.0, which supports the Nikon D5500 and D7200. D4s Firmware Update. Nikon yesterday updated the D4s firmware to version C1.20, with the big news being lifting the restriction on continuous shooting sequences when in Manual or Shutter-priority exposure mode. Article on dslrbodies.com. Panasonic GH4 Firmware Update. Panasonic today released firmware 2.2 for the GH4 camera. Article on sansmirror.com. Zeiss Goes Batis for Sony FE. Zeiss announced two new prime autofocus lenses designed for Sony E and FE mount cameras, the Batis 25mm f/2 and 85mm f/1.8 lenses. Article on sansmirror.com. 25mm f/2 data page. 85mm f/1.8 data page. The D400 in 2011. Every now and then I do a full browse through all my files and notes and decide which to archive, which to update, and which to throw away. In my latest round, I discovered my notes from discussions in 2010 and 2011 with various Nikon folk about what the D300s replacement was likely to look like. Article on dslrbodies.com. Lightroom 6 and CC Roll Out. Adobe today announced and shipped Lightroom 6.0, a major revision of their photography workflow product, as well as Lightroom CC. Article on dslrbodies.com. Other April Software Updates. Article on dslrbodies.com. Notice: I’ve gone to a constantly updating page for this. In other words, if any more updates appear in April I’ll just add them to this page unless they demand an article of their own, such as the Lightroom announcement. Each month I’ll post a new article to which I update any new updates as they roll out. What to Make of the New D750 Discount? Earlier this week, Nikon put the D750 on sale at US$1999.95 (or with the 24-120mm f/4 lens for US$2699.95). Curiously, the D750 filmmakers kit doesn’t get a discount. Article on dslrbodies.com. Another Nikon Early Ship Problem? Updated A number of early purchasers of the 300mm f/4E lens reported issues with VR at lowish shutter speeds (e.g. 1/125 second). I’ve received dozens of reports, and complaints have popped up on in high visibility on a number of Internet fora, as well. Article on dslrbodies.com. Fujifilm Adds a Prime. Fujifilm today announced the long-awaited 16mm f/1.4 lens for their XF mount cameras. Article on sansmirror.com. Lens data page. What’s Up With byThom Books? 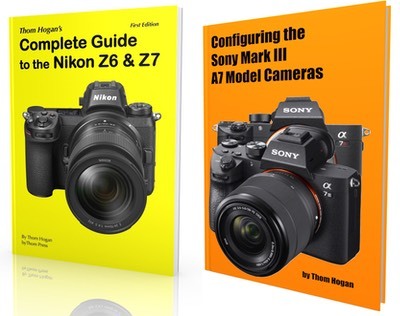 Many folk don’t realize it, but I’ve been writing Nikon-related books for twenty years now. Article on dslrbodies.com. Apple Photos Underwhelms. With the recent update of the Macintosh operating system to version 10.10.3, Apple also shipped the final version of their new Photos application. Article on dslrbodies.com. Finally. Ordered 7/11/2014, shipped 4/14/2015. What product took so long to appear? Article on sansmirror.com. What’s the Point of Taking a Photograph? I know what your answer is. But what do camera makers think the answer is? Article on dslrbodies.com. Price is the Problem? Maybe everyone is grumpy from calculating their taxes or something, but I keep hearing the same refrain lately: "camera prices are too high." Connected with this thought is always the “the camera companies would sell a lot more product if they lowered their prices.” Article on dslrbodies.com. NAB Warning. The National Association of Broadcasters convention (NAB) is next week, and the video-related announcements are going to start flying, as this is the place where the true video geeks get their geek on. Indeed, they’re already flying. Updated Article on dslrbodies.com. What’s Coming in Sensors. Everyone seems to want to know what’s happening in the sensor world. Okay, I’ve got a few bits of information for you. Article on dslrbodies.com. Can Your Lens do “Velvet”? Apparently that’s the new need: “lens delivers velvety, glowing, ethereal look at brighter apertures, and beautifully sharp but subtly unique images as you stop down.” Lens data page. Recent Mystifying Nikon Quotes. I didn’t say it, they did. Article on dslrbodies.com. Does This Answer Your Question? Every time I write about a D300s replacement, I get the inevitable “but Nikon would never do that because the D610 body already sits at that price point.” Okay, sure. Article on dslrbodies.com. Samyang/Rokinon 100mm f/2.8 Macro lens Announced. Nikon mount version. Mirrorless mount versions. Nikon Announces J5 Camera. “I am the beauty of speed” has been updated to “I am commanding speed.” Article on sansmirror.com. Data page for camera. Fujifilm Updates XT-1 Firmware. Article on sansmirror.com. The Sony/Olympus Connection. Since I’ve covered this story from its beginnings in the fraud that crippled Olympus a few years back, I suppose it only fair that I continue to cover it. Article on sansmirror.com. The Canikon Fallacy. I’ve seen a lot of reporting that goes something like this: Canon and Nikon have been ignoring the mirrorless market and that’s why their DSLR duopoly is in trouble. Article on sansmirror.com.